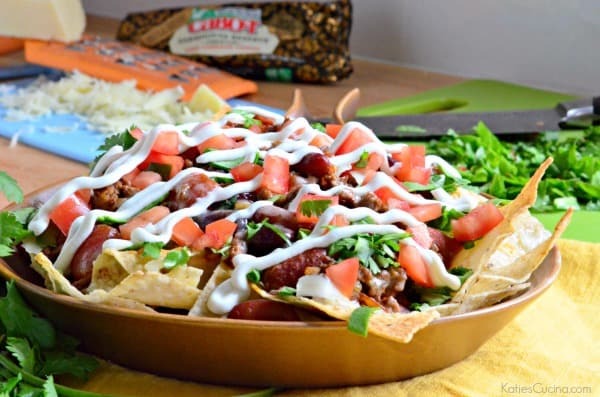 Belly up to a big old plate of homemade Loaded Chili Cheese Nachos. 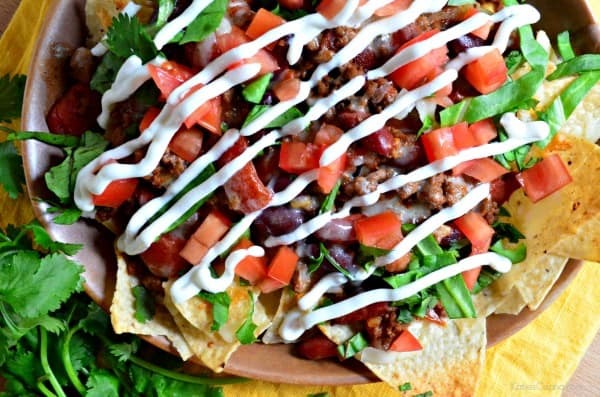 Gone are the days that you need to go to a restaurant to make nachos this good. A few weeks ago my husband and I took our first family vacation with our son, Ryder. We spent 4 days on a Royal Caribbean cruise. We had a great time. Of course much different than past cruises together–gone are the lazy days spent sun up to sun down lounging on lido deck, or endless adult beverages. But I’m ok with that… well at least the second part. We spent breakfast and lunches at the buffet because that was the only way we were both able to eat lunch without full melt downs. On the last day at sea, Ryder, spent the morning at the nursery while my husband and I enjoyed a few quiet adult hours poolside. We also grabbed a quick (and light) lunch at the deli. I enjoyed the most delicious creamy carrot soup and a fruit salad and my husband had a hot pressed sandwich. We rushed over to the nursery to grab Ryder before they closed and found ourselves with one cranky baby. Back to our cabin we went and all of a sudden it was family nap time. 3 long glorious hours later and it was 3:30 in the afternoon before everyone was up and ready to have fun again. Recharged and starving the only thing open was the buffet. They had a “snack” hour from 3-5pm. Mostly for the piggies who like to eat all day and night. Thankfully we were able to grab a snack too to fill the void of our light lunch. They happened to have homemade nachos on the buffet bar along with chili, a watered down queso dip, freshly diced tomatoes, shredded lettuce and sour cream. My husband grabbed a chili cheese dog–I on the other hand made myself a giant plate of chili cheese nachos. I don’t know what it is about nachos, but I love them. If I’m super hungry there is nothing that satisfies my appetite more than nachos. Bring on the piled high nachos at the chain restaurants. Everyone also can make room for a few nachos. And the more loaded the better in my opinion (hold the jalapeno’s though). A few days after we returned from our trip I was still craving nachos. I knew that we weren’t going to go out to a restaurant just so I could enjoy a big plate of nachos so I decided to make some at home. Plus, it worked out well because I had chili for later on in the week for dinner. 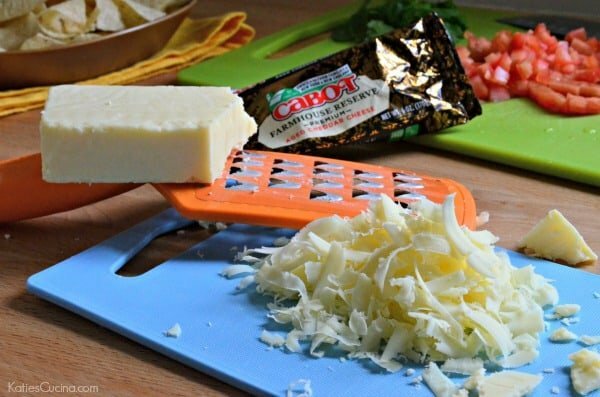 I shredded a block of Cabot Farmhouse Reserve Cheddar. A little about this cheese: A bold and creamy Extra Sharp with a Northeast Bite! This cheese delivers lush and rich taste in a mellow, well-defined, slightly crumbly body. Balanced flawlessly, this artisanal-grade cheddar whispers with subtleties that are evocative of our farmers’ valley fields. As in the best cheddars, classic sharp notes linger appealingly through each bite. 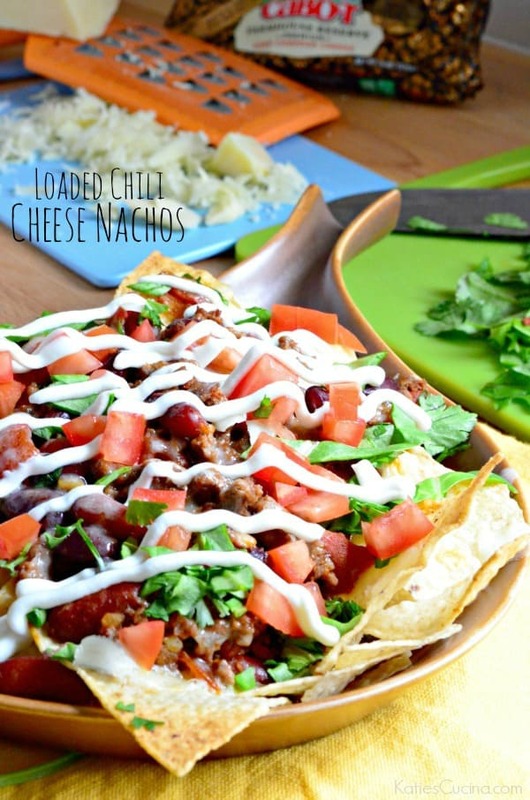 Since I’m not one to like really sharp cheeses this farmhouse reserver is perfect and gives just the perfect amount of creaminess that is needed to make these loaded chili cheese nachos complete. Of course my husband never boycotts nachos for lunch, so that’s exactly what I did after returning back from our vacation. We had a big old plate of chili cheese nachos that we enjoyed one-by-one until they were all gone! Preheat the broiler on high. Re-heat chili if needed. Prep toppings while chili is reheating. Place corn tortilla chips on a baking sheet. Pour chili on top and top with shredded cheddar cheese. Bake for 2 minutes until cheese is bubbling. Remove from the oven and top with diced tomatoes, lettuce, and cilantro. Place sour cream in zip lock baggy, cut a small piece of the corner off the bag and drizzle on top. Enjoy. Nachos must be the most perfect food ever. I love this recipe. I love love nachos. Great recipe. Nachos=Food of the Gods! These looks completely amazing. Agree Candace! Something about nachos that I can’t resist!